Quickly remove up to 8 gallons per minute with ease! Tired of soaking wet feet in your canoe, kayak or small fishing boat? Get rid of pesky excess water the hassel-free way with this hand-operated Bilge Pump. You can pump up to 8 gallons per minute with this bad boy. Its easy. Simply pull up on the handle, sucking in water through the base. When you push down, the water shoots out the top hose and out of your boat. 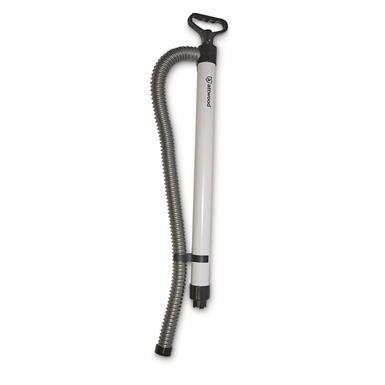 Fight that sinking feeling with this Attwood Bilge Pump! Great too, for cleaning out a live well, or even an aquarium. Hurry to order yours today!